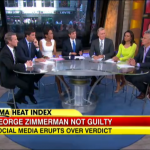 Yesterday, on Good Morning America, Dan appeared to discuss the rage on Twitter that has been sparked by the George Zimmerman acquittal. Dan says, “I think we have to be careful about those who are now misstating the facts and the law in responding to the case and so a lot happened during this trial and if you watch the whole case and you agree or disagree, great. But there are a lot of people out there now who are, I think, misstating either the law or the facts and we have to be careful. I’m not saying it’s the right or wrong verdict. Just let’s make sure we stick to what actually happened in court and what’s actually the law and, again, I think that those in particular on Twitter, etc., who have been supporting the Martin family, I think that’s wonderful.” Watch the segment here.